When we think of food, most of us just generally think of how to cook it and eat it. But this blog is not just a recipe blog; it’s dedicated to exploring our connection with our food sources from around the world, from start (life) to finish (your meal). Different cultural traditions have different ideas about food, and the more we understand the world we live in, the better choices we can make about how we live. And… how we eat. With that in mind, Shark Week (and, it seems, the week after Shark Week) is a good time for us to take a deeper look at the current state of the oceans and their ecosystems. If you’ve been dutifully paying attention to your shark programming, you will have noted that there is an annual migration of Great White sharks from Guadalupe Island off the coast of Baja California, to Hawaii between December and July. People still don’t know exactly why they migrate for such a long distance, but the guess is that they go to Hawaii to mate. Another group of Great Whites come from Northern California to more or less the same area around Hawaii, although the two groups have never been witnessed interacting. And this leads me to today’s post. Most people only think of the lushly forested islands and the clear blue waters around Hawaii. 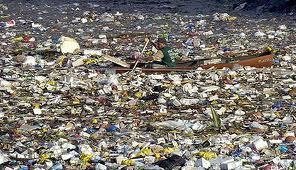 But few think of a growing island of plastic trash known as the Pacific Garbage Patch that looms nearby. This giant trash pile is the size of Texas (some say twice the size of Texas) and is made almost exclusively of discarded plastic that has found its way from the many waterways that feed into the vortex of currents. While it is not unequivocally proven, there is evidence that much of the trash comes from California. Other garbage “patches” are now forming in gyres around the Pacific and around the world. But the one near Hawaii remains the largest by far. Aside from just being kind of gross, why is this a big deal? 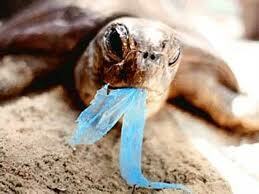 Birds mistake many of the plastic pieces for sea life and fill up on the trash. Worse yet, they regurgitate these plastic bits into the stomachs of their young, leading to starvation because no real food has been transferred. There would be no space for it in any case. Fish are also being affected as the ocean is invaded by miles and miles of plastic, suffocating any zooplankton (fish food) that would grow on the surface of the water. Turtles and other sea animals are all interconnected on this food chain and are being impacted as well. Maybe this one huge island of trash won’t directly impact the seafood on your plate. But the fact that many more of these islands are sprouting up around the world, wherever the currents meet, is something that we as consumers should at least be aware about. 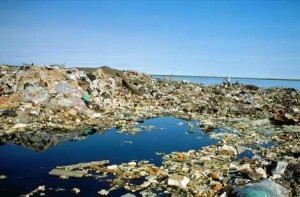 To learn more and find out what you can do to help, visit Greenpeace’s action site on the Garbage Patch. Greenpeace has been at the forefront of fighting this beast for some time. Once we really get to know about the problems our oceans are facing, we realize just how fragile and vulnerable they are. And this is yet another reason we should take an extra moment to think about the kinds of seafood we buy! It only takes a little bit of effort to follow a Sustainable Seafood guide, and the benefits are well worth it! i hope this world ends.